AIRSIDE™ ASSET MANAGEMENT SYSTEM. 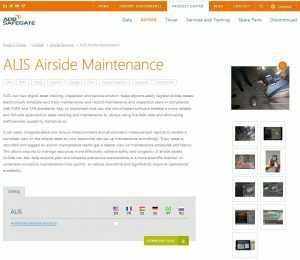 ADB SAFEGATE has introduced its new Airside Location-based Inspection and Service solution (ALIS) for scheduling and tracking airside maintenance actions. 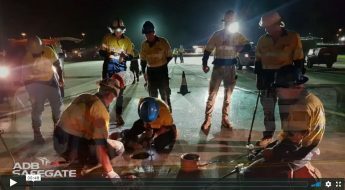 The cloud-based solution enables a more reliable and fail-safe approach to collaboration between maintenance teams, managers and even airside operations, by eliminating inefficiencies caused by human error. 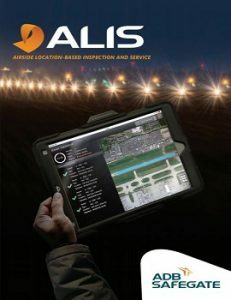 Easy to implement and use, ALIS was conceived by airport maintenance experts keeping in mind very specific requirements including the need to achieve compliance with ICAO and FAA standards. ALIS integrates photometric measurement reports to enable a complete view on each airside asset so your personnel can set up maintenance accordingly. Night work at DTW (Detroit) testing the new GPS feature of ALIS (Airport Location-based Inspection System). This torque management product is just one of many tools within our Airside™ Asset Management system. ALIS is able to record any type of on-site maintenance task by validation method and can register torque data from the fully integrated electronic torque wrench or high-tech nuttrunner. This enables airports to have accurate reporting on the actions performed resulting in a complete view of airside asset maintenance status. ALIS can also help airports plan and schedule preventive maintenance in a more visual manner, or undertake corrective maintenance more quickly, to reduce downtime and significantly improve operational availability.